Although this sounds like a headline from the National Enquirer, it is actually a true story about a very courageous woman who is an inspiration to all of us. As part of my blog, I enjoy sharing interesting or unusual patient profiles with my readers. All surgeons are humans and sometimes don’t get much credit for the personal side of life. Sometimes the public brands us a scalpel wielding machines without other interests. This is what led me to include “patient profiles” as an occasional blog topic. One day, several years ago, I was preparing to enter the consultation room and I could tell by the body language of my staff that something unusual awaited me. I inquired “what is going on” and was told “you will see”. When I entered the room, knowing this was a facelift consult, I was a bit taken back to see a visually impaired person with dark glasses and a Seeing Eye dog. A million things ran through my mind at once. “Was this a joke?”; “Was the patient in the wrong office?” “Was my staff behind this?” I introduced myself like I always do and shook the patient’s hand. “What can I help you with today?” I asked. “I am here to discuss having a facelift” answered the petite lady in sunglasses while her dog wagged his tail as if to approve of my presence. This was my first conversation with Susan Dunham, who would make a life lasting impression on me and my staff that day. Susan began a rather long story about an abusive father that frequently reminded her that she was “ugly”. It bothered him so much, she explained, that he took her to a surgeon for a chin implant in her early years. She went on to describe a pretty tough life with an abusive and failed marriage and then contracting a disease that robbed her of her vision. Susan is a survivor! She pretty much has prevailed under adversity where most of us would have failed and given up. She described her disability as “not a big deal” and did not feel that she was missing anything. She basically just started her life over. Susan told me that she was dieting and working out daily at a local gym. She told me that she is young and wants to date and despite her healthy regimen, she can feel herself aging. She went on to say how much she wanted to do a facelift but she cannot secure employment of her talents and can barely get by with the expenses of life and raising her children. She said that getting cosmetic facial surgery was basically a dream and she knew she could not ever afford it. This was a pretty emotional conversation for both of us. My staff and I were pretty captivated with this brave person and it was my pleasure, I told her, to perform her facelift on a pro bono basis. Susan was pretty taken back that a stranger would do thousands of dollars of surgery for free. We told her it was our honor and pleasure. It was also a week before Christmas and it was probably the best gift I would ever give. Fast forward to surgery day. Susan and “Puppy” (we are not allowed to know the dog’s name as calling him by name would be a working distraction. The dog has a sign on his collar “don’t pet me, I am working”) presented bright eyed and bushy tailed (especially Puppy). Although Susan and Puppy are constant companions, he was denied entry to the operating room and waited somewhat nervously throughout the surgery. Whoever said a dog was man’s best friend was spot on! 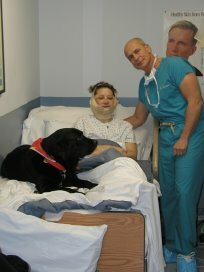 After several hours of surgery Susan was wheeled out of the operating suite and Puppy accompanied her to the recovery room. Surgery center or not, we could not restrain Puppy from joining Susan in bed. Susan did pretty well postoperatively but called me the night before Christmas Eve stating that she was bleeding from one side of her surgery. My wife and I were on our way to a black tie event and were diverted to Susan’s home. Darn it! She was bleeding under her facelift flap and I did not want it to progress. Since Susan obviously does not drive, I loaded her and Puppy into my car, dropped my wife off at the party, and found a few staff members that met us at the office. We opened the stitches and controlled the area of bleeding and I was finished just in time to pick my wife up after the party. These things happen. Susan went on to heal uneventfully and was soon back at the gym, grocery store and walking her dog. Her friends were quick to notice her new look and the local newspaper also took notice and wrote a nice article about her experience. Click below to view the article in PDF format. Somehow, and probably to the power of the Internet, Susan was contacted by the Sunday Magazine from the London Times who also wrote a very nice article about Susan. Susan visits on a regular basis, and we have plumped her lips and done a few other minor procedures on her. She is simply a joy to be around and has been an inspiring force in our lives. Funny where cosmetic surgery can lead. Can Cosmetic Facial Surgery Change Your Life? Only Use A Board Certified Plastic Surgeon?